Rambo I Stallone Signature Edition Knife | BUDK.com - Knives & Swords At The Lowest Prices! 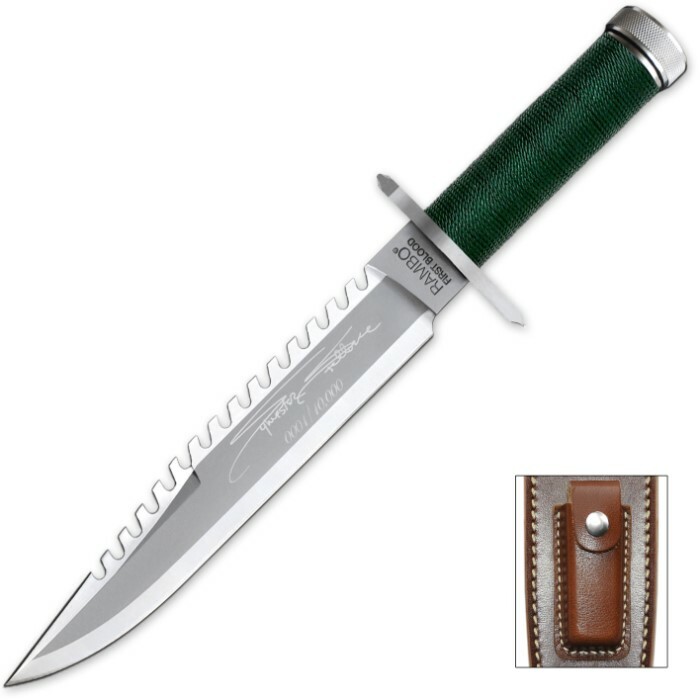 The Rambo First Blood Part I knife features push tang construction and a hollow aluminum cord gripped handle that contains a precision compass mounted in the pommel and an emergency survival kit. The stainless steel guards incorporate a standard and Phillips head screwdriver points in the design. This is the officially licensed Rambo movie knife. I have to give this knife 5 stars because the handle is spot welded to the blade tang with a slip cap also the sheath is made of buffalo mine come with a sharping stone not like the others can't say why but I am grateful to Bubk. for such a grate knife Thanks Budk for taking care of this returning customer.. It's a excellent knife. For collectors and survivalists alike. Not sure it's exactly the same as Rambos knife in first blood but regardless it's a good knife. First of all I am a very big Rambo fan. I have one of the original life first blood knives and a next generation first blood knife. Those were not cheap! And this first blood variant closely resembles the two that I have! Its got a full flat grind and the tang gos half way into the hollow handle and is held in place by a very thick bolt going through the handle and the tang mating it very strong this is the only one I take camping with me for obvious reasons and it hasn't let me down! Its very easy to sharpen and stays sharp! The 420j2 they use for this knife is very tough and the sheath is just as tough!